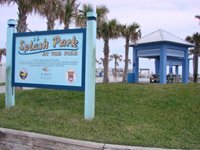 We found the perfect kid-sized splash park and playground with sand, all in one great location at the Splash Park at the Pier! This park has several jets of water coming out of the concrete base, to delight the kids! The splash area is directly next to a large jungle gym set in sand, so the kids can play in the sun and the sand for hours! There are plenty of covered picnic tables and benches, for families to take a break and have a bite to eat out of the sun. Restrooms are right next door. After we play at the splash park for awhile, we like to go to the pier store, and get an ice cream, and buy a pier ticket for .50, then take a walk on the St. Augustine Pier and see what the fisherman are catching. This is also a good place to buy that hard to find local fishing book. Today they were catching whiting, and the pelicans were all over the pier waiting for a leftover morsel! We were lucky enough today to catch some surfers catching some waves! Sometimes we go down to the beach after the splash park,and check out the waves, and the birds and the sand. If you go on a Wednesday, half of the parking lot is packed with booths for their Farmer's Market. You can find some really interesting things and get some great deals. What a wonderful bonus for an interesting and adventurous day!